I have loved Pink since back in the day. I have insanely fond memories of driving in my friend Sarah-Beth's convertible listening to her first album and feeling like the coolest person on the planet. Given that was wearing a toe ring at this point in time and probably a WWJD bracelet, I was many things, but "cool" was not one of them. Time has passed and while my sartorial crimes are no longer as dire, my passion for Pink is just as strong. It's grown stronger with this amazing post she shared on Instagram. As we all know, women (and celebrities in particular) face a lot of pressure to transform our bodies almost immediately once we've given birth. That is insane, and Pink knows it. What is not to love about this? Pink dropping knowledge, being body positive and accepting and above all else KIND to her body! And why shouldn't she be? Much like all of us, her body has done tremendous things for her. It's given her two kids, helped her launch and maintain a successful career, allowed her to continue to dye her hair any number of shades without falling out at the root. 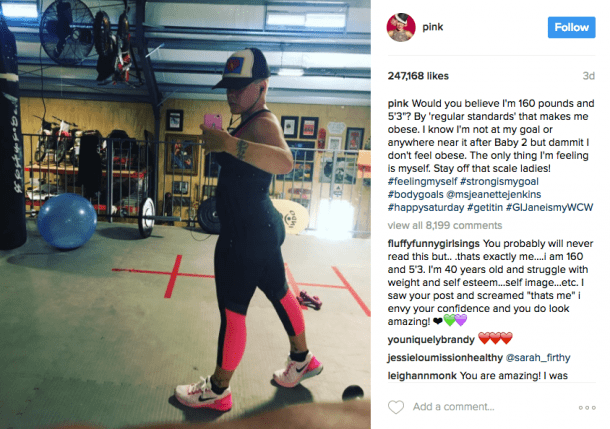 Pink's got it figured out: Our bodies aren't the enemy. The standards our society tries to apply to our bodies are! That knowledge itself is so freeing! So why hasn't some magical transformation taken place? Why are we still looking at our bodies like they are crime scenes or sinks full of dishes, outrageous, messy, and unacceptable? Because stigmas like the ones we have toward women (and women's bodies in general) can't just be dismantled with one social media post, no matter how important that post may be! Even Pink herself is only halfway on board with the message she's selling. Just look at how she feels the need to remind us that she just had a baby and that she knows she hasn't met her goal yet. Those things might be true, but they shouldn't be necessary bits of information shared with the universe to rationalize the shape of the body of which you are currently in position. All of that said, hell, I will take this as a win. Get down with your bad self, Pink.